A few years ago, I fell in love with podcasts. I found myself living alone unexpectedly, and I filled up the quiet space with stories I could listen to anywhere, anytime. I craved the feeling of total immersion that I only got from radio. I remembered the weathered black leather case of books on cassette tape that I listened to over and over as a child and how vividly I could see the Metropolitan Museum of Art in From the Mixed-Up Files of Mrs. Basil E. Frankweiler. I realized I was learning and remembering stories in a different way through podcasts, perhaps because I was filling in some of the pieces myself. Quickly, I began thinking as much about how the story was being told as the story itself. I started to tell people that I wanted to get into podcasting. I bought a recorder and some headphones and started interviewing my grandmother. 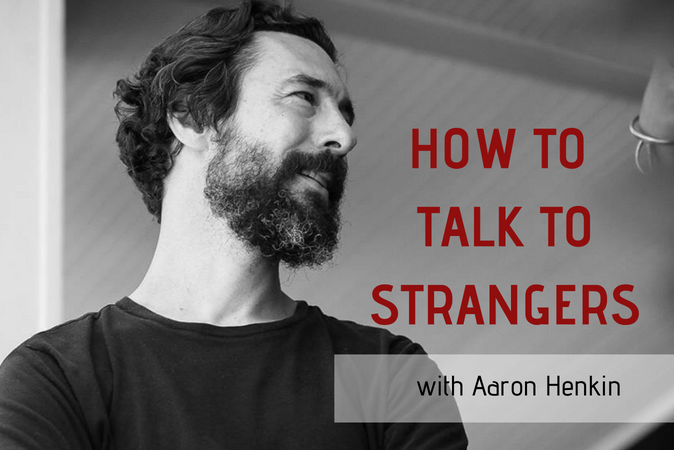 I told lots of people in Baltimore about my podcast ambitions, and they all suggested I talk to one person: Aaron Henkin. I didn’t know who Aaron was at the time, but I quickly started listening to Out of the Blocks, his podcast on WYPR. Still, I didn’t have the courage to reach out to him. What would I even say? 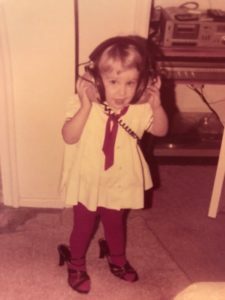 I had zero technical skills or relevant experience, just a lifelong affinity for headphones. I’ve always been an audiophile. One day, as fate would have it, I was at WYPR to do an hour-long call-in show on summer learning. I heard a disembodied voice from around the corner and immediately recognized it to be Aaron. Although I still didn’t find the courage to approach him at the radio station, I did go back to my office and send him an email. I felt like my stint on Midday provided an opening, so I asked him for advice on getting started in podcasting. He wrote back right away and offered to chat. He suggested I give myself assignments—first try to produce a 10-minute story, then 15 minutes and then 30 minutes. He recommended I delve into everything they offer at www.transom.org and start listening to How Sound, a podcast about radio storytelling. It was the kick I needed to get started. I turned an interview with my grandmother into a 30-minute story with narration. Although I’m still far from proficient in sound recording or sound editing, it showed me that my storytelling skills matter and gave me the confidence boost I needed to keep going. Last year, I joined the Marketing and Communications committee of Wide Angle Youth Media, an amazing media education program in Baltimore, and was happy to find Aaron on the committee as well. What is so awesome about Aaron, other than his generosity with his time and talents, is that he just goes for it in his work. Like all creative geniuses, Aaron was waiting tables when he got the chance to work at WYPR. He didn’t have any formal training or credentials, but he took a leap and learned. Out of the Blocks (for which Aaron and his co-host Wendel Patrick just won a national Edward R. Murrow Award!) was borne out of that same sense of exploration and curiosity. The show dedicates each episode to one city block in Baltimore. It’s a fascinating mix of life, love, family and business and offers constant contrasts in change and permanency, native and immigrant experiences. Aaron spent four months on a block to make the first episode as a kind of experiment. Now, he spends about six weeks per block, still a significant and meaningful commitment. Aaron describes the stories of the people on the block as tiles in a mosaic and each block as a piece of a broader tapestry of Baltimore. Out of the Blocks has no narrator and an incredible custom musical score for each episode by Wendel Patrick. Aaron and I talked for about an hour, and he was kind enough to record our entire conversation. You should listen to it! He’s got a real radio voice, after all. Everyone has a story to tell, but not everyone knows how to tell it. Often as I listen to Out of the Blocks, I find myself thinking, where does he find such incredibly sage, wise and reflective storytellers? Would I find such well-crafted stories if I stopped and talked to any stranger on the street? Probably not. I had never thought of it this way before in documentary journalism, but Aaron acts like a director, gathering multiple “takes” of a story. It gives him options in editing, but also might advance the story in a different way or give someone the time to figure out what they are really trying to say. Interviews can be good for the soul. 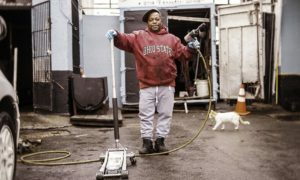 “Shorty,” from the 2100 block of Edmondson Avenue. Storytelling brings us closer together. One of my favorite anecdotes from Aaron was about a “church lady from the county” who reached out to him after listening to the show. She described her social group of “older folks” who “do these adventurous things and care about Baltimore City and progressive ideas.” She wanted Aaron’s recommendation for a place they could go to lunch to really experience the city. He recommended Northeast Market on the 2100 block of Monument Street, and they went. Given my experience working for the Mayor of Baltimore while The Wire was still in production, it makes me really happy to know that honest media about Baltimore is inviting more people into the city instead of scaring them away. What’s the one story Aaron just can’t shake? It’s in this episode (400 block of East Patapsco) of out of the Blocks. He talks about it in the 34th minute of our conversation. Out of the Blocks is now telling stories from St. Louis and Detroit, and I’m sure that’s only the beginning.